Smart Text Selection was introduced in Android 8.0 Oreo, and has two components. First, when you tap on a word, it selects the entire phrase (e.g. tapping 'Disney' expands to 'Disney World'). Second, it suggests an action or two based on what is selected (e.g. a link to Google Maps appears when selecting an address). Chrome OS has been adopting plenty of Android features lately, and it looks like Smart Text Selection is next. With the launch of the second developer preview of Android back in May, Google added a surprising and useful feature to the Overview interface. You could highlight and copy text and also make use of Android's smart text selection functionality. Optical character recognition (OCR) capabilities meant you could also pull text from images. Even more interesting was that you could select and copy images in the same way, including those from apps that don't allow media to be shared (such as Instagram and Snapchat). Sadly, in DP4 this feature is no longer present. 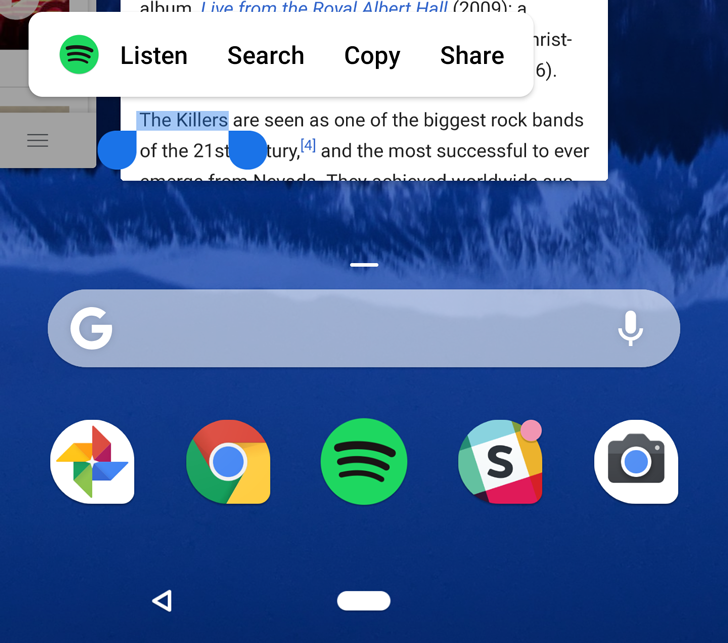 Probably the most divisive new feature in the second developer preview of Android P is gesture navigation. The optional 'Swipe up on Home button' setting removes the Recents button and replaces the Home button with a pill. Swiping up from the pill triggers the new Recents (also known as Overview) interface, and the apps are now arranged horizontally — much like the current behavior of iOS. There were a number of small but interesting features of Android O (Oreo? Octopus??) 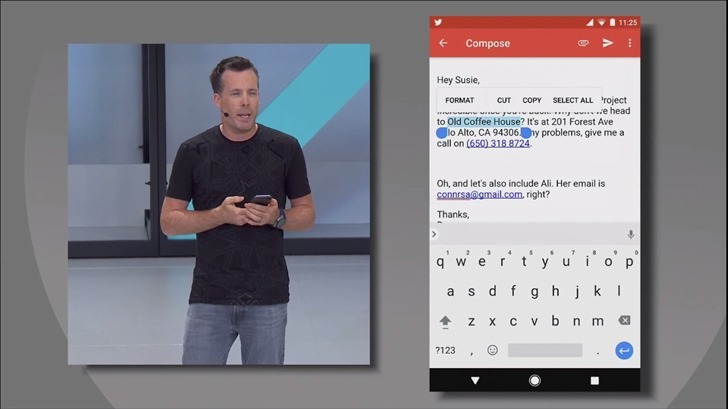 that popped up at Google I/O back in May, and one of those was Smart Text Selection. I'm sure we've all been frustrated when trying to select text on our phones, and this feature intends to fix that by highlighting exactly what we need with a simple double tap. Now, Google Docs is implementing this feature and it should work for anybody currently running the Android O Beta. One of the new features in Android O that was recently announced at I/O is Smart Text Selection. Selecting the right text can be hard on a small screen, but Google's data shows that most of the time when we are selecting information it's something like an address or phone number. 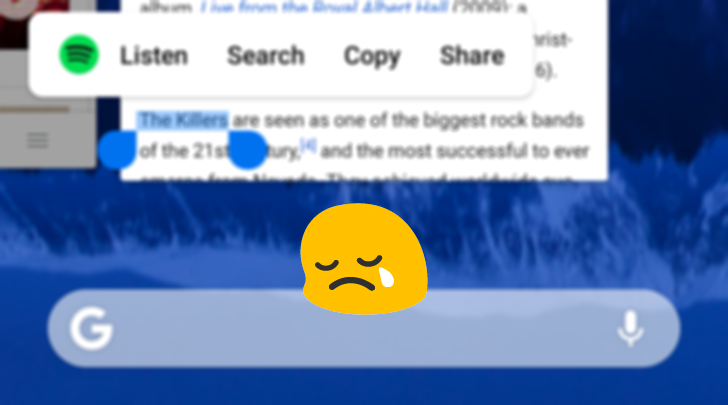 Now in Android O you can double tap text, and the selection automatically expands as needed. It even shows a convenient predictive shortcut so we can use it in another context, or save it. Of course, we can use the Assistant to do all those things if we remember, but it's good to have multiple ways of solving the same problem.